Gabe Vasquez is the Vice President of Communications First Focus, and leads the organization’s internal and external communications efforts. 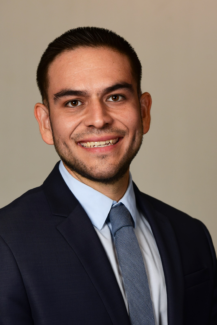 Vasquez oversees all aspects of communications at First Focus and works to secure news media coverage of its advocacy efforts and federal children’s issues. His responsibilities include working with First Focus policy staff to translate advocacy activities into material for the media, tracking news coverage of the organization, and collaborating with the organization’s Senior Director, Digital Communications, to create and curate engaging content. Prior to joining First Focus, Vasquez was a Field Representative for the State Office of US Senator Martin Heinrich, New Mexico, where he managed an issue portfolio that included immigration, civil rights, colonias development, international trade, economic development, and education. Before joining Senator Heinrich’s office, Vasquez was the vice president of public relations for a national home safety technology company, where he managed internal and external communications for three of the company’s subsidiaries and its investors. Vasquez also served as the executive director of the Las Cruces Hispanic Chamber of Commerce and worked for several years as a newspaper editor, where he received several press association awards for business writing. Vasquez has been invested in the communities he works in, serving on the boards of the Casa de Peregrinos Emergency Food Kitchen, Las Cruces Hispanic Chamber of Commerce, Honor Flight of Southern New Mexico, Downtown Las Cruces Partnership, and the Young Philanthropists of Southern New Mexico. He is a first-generation American with roots in Ciudad Juarez, Chihuahua, Mexico, and holds a B.A. in English and Journalism from New Mexico State University.